A new outbreak of the Ebola virus in a densely populated part of Congo has global public health officials concerned that simmering conflicts between rival ethnic groups could hinder efforts to contain one of the world's deadliest pathogens. Civil strife in Congo has surged in recent years, driving millions of people from their homes. The United Nations reports 2.8 million Congolese are internally displaced, and a million of those people live in refugee camps or villages in North Kivu Province, where at least 20 people have died of the Ebola virus in recent days. Fighting an outbreak of the Ebola virus is dangerous and complicated in the best of circumstances. Congo only recently concluded its battle to contain the last outbreak, in Equateur Province in the northwest corner of the country, a much more stable region where ending the outbreak nonetheless took months, hundreds of international volunteers and tens of millions of dollars. [post_ads]But containing a viral outbreak in North Kivu presents health-care workers with an unprecedented challenge because of the threat of violence between warring ethnic groups. The health-care workers who flood into North Kivu will find themselves "in a war zone," said Peter Salama, the World Health Organization's deputy director-general of emergency preparedness and response. "We have the added problem of major insecurity and population displacement," Salama said in an interview from his office in Geneva. "That may mean armed military escorts." The security situation threatens to make one of the most basic elements of virus containment far more complicated than usual. To control the virus's spread, epidemiologists typically find and monitor those who have come into contact with an Ebola victim, a practice known as contact tracing. Those contacts are most likely to come down with the virus next, and getting them into treatment before they can infect someone else is critical to stopping a virus's spread. Security concerns in North Kivu might mean contact tracers cannot move freely about the region, and that some contacts might then fall through the cracks. If one of those contacts gets the virus, he or she could start a new conflagration without health officials being aware. "We're going to be quite confined to the town of Beni where there's quite strong national Army and [United Nations peacekeeping] presence," Salama said. "We're going to have to accept that certain contacts escape our purview." The outbreak began in late July, when a woman in rural Mangina health area came down with symptoms of a hemorrhagic fever after being discharged from a local hospital. Several of the woman's relatives experienced symptoms after burying her body in a traditional funeral ceremony. At least 20 people have died of a viral hemorrhagic fever suspected to be Ebola. Laboratory tests confirmed that four of six blood samples tested were positive for the Zaire strain of the Ebola virus disease, the deadliest strain, which has killed more than half the people who contract it in most outbreaks. It is the same strain that rampaged through the West African nations of Liberia, Guinea and Sierra Leone between 2014 and 2015, where more than 11,000 victims died. "That's good news and bad news. The bad news of course is we know that [the Zaire strain] has the highest death rate among those infected. The good news is we know the vaccine we've been using on the other side of [Congo] is effective against that strain," Salama said. Congolese Health Minister Oly Ilunga Kalenga told Reuters on Friday the country could begin administering the vaccine as early as next week. More than 3,000 people were vaccinated in the outbreak in Equateur Province, beginning with front-line health workers, traditional healers and even taxi drivers who might transport patients to Ebola treatment units. 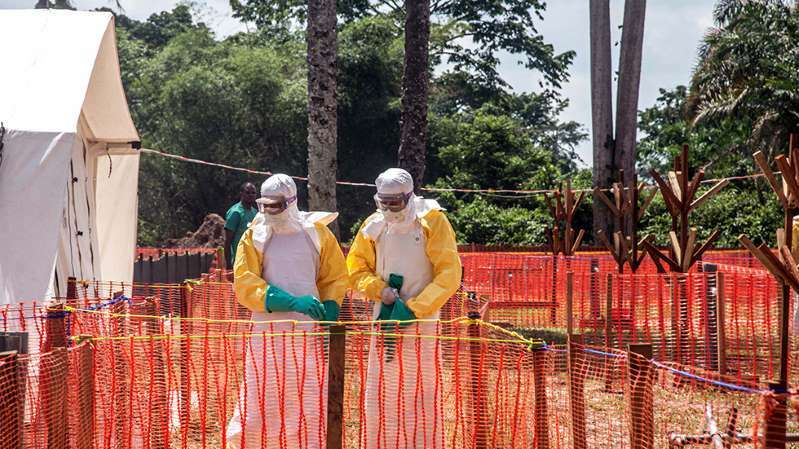 The Congo's Health Ministry said it had sent a dozen virus hunters to the city of Beni, about 20 miles from the outbreak's epicenter and home to about a quarter million people. Salama said he had sent 20 people to the region, and 10 more are on their way.